It appears history was made one more time by Carl Joshua Ncube who didn't pull any punches at his LATE NIGHT show held in Harare this past weekend. The Comedian came out guns blazing unleashing the most unrestrained attack on everything from CORPORATE to RELIGIOUS and the most taboo of all topics POLITICS. 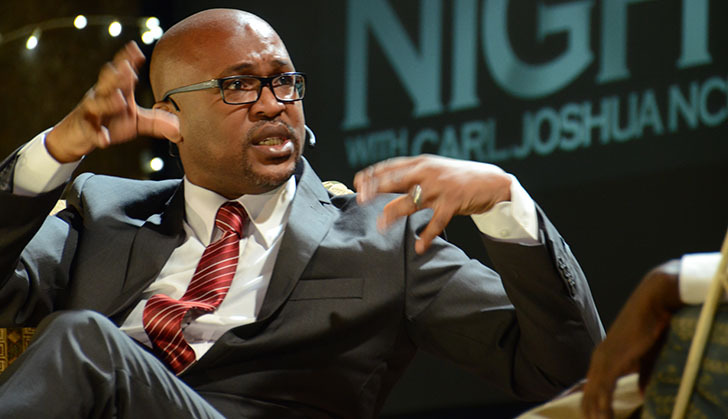 Carl launched a LATE NIGHT show which he described as a SATIRICAL NEWS PRODUCTION in conjunction with local film company Media Matrix. The show featured hard hitting news parodies, interviews with guests like comedian of the moment Doc Vikela, media expert and blogger Larry Kwirirayi and first female and award winning animator Claire Dongo. The comedian stressed the importance for Zimbabweans to build a thick skin when it comes to comedy stating that noone should take anything said in these shows personally as they are only parodies. A late-night talk show is a subgenre of the talk show genre. It is specifically a kind of comedy-oriented talk and variety show that airs late at night. Characteristics of the genre include topical monologues in which the host makes fun of the day's news, comedy sketches, celebrity interviews, and musical performances primarily by new and current artists signed to a major record label. The late-night talk show format was popularized, though not invented, by Johnny Carson with The Tonight Show Starring Johnny Carson on NBC. Often late-night talk shows feature a desk, behind which the host sits to interview guests. Many late night talk shows feature a house band which generally performs cover songs for the studio audience during commercial breaks and occasionally will back up a guest artist. Late-night talk shows are a popular format in the United States, but are not as prominent in other parts of the world. Shows that loosely resemble the format air in other countries, but generally air weekly as opposed to the nightly airings of those in the United States. They also generally air in time slots considered to be prime time in the United States where African Comedian Trevor Noah was recently appointed host of the daily show. Before Carl Joshua Ncube sets off to South Africa for his debut performance at Comedy Central's International Comedy Festival, the trailblazing Zimbabwean comedian stated that his intention was to prepare himself for greater exposure to international audiences hence the importance of developing this LATE NIGHT show to grow his reach on the African broadcast scene then the international scene as Africa's newest LATE NIGHT show host.